This Whole30 pizza recipe will be your new go-to during your whole30. 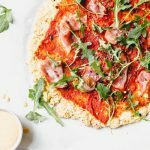 It’s made with a cauliflower crust and you can use as many compliant toppings as you wish! Preheat oven to 425° and line a large baking sheet with parchment paper. Line a large bowl with cheese cloth and set aside. Cook both bags of cauliflower rice according to the package instructions. Pour cauliflower rice on top of the cheese cloth and wait for it to cool a bit. Then, use both hands to press as much liquid out of the cauliflower rice as possible. If the cauliflower rice is too water-y, the crust will turn out mushy. Pour dried cauliflower rice into a separate bowl, then stir in the flour, seasoning and salt. Last, stir in the egg. Use your hands to form mixture into a ball, then transfer it onto the parchment-lined baking sheet and press down on it, forming the mixture into a circular crust. Bake crust by itself for 15 minutes. Remove crust from the oven, then add your toppings! Start with the sauce, then add on your meat and veggies. Place pizza back in the oven and bake for 10 additional minutes. Remove pizza, wait a few minutes before slicing and serving. You can use whatever compliant toppings you want! Feel free to add more toppings and/or your own vegetables or meat–whatever your heart desires.